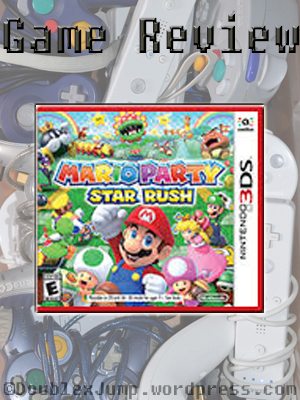 I’d like to say that this game plays like the other Mario Party games, but it doesn’t. You and your opponents all move during the same turn, but not in a car. You have free reign to move where ever you want. And when I say that, I really mean it. The boards aren’t linear at all so you can run in little circles if you so choose. That’s the main mode of the game, called Toad Scramble. You don’t choose your own character, everyone is a different-colored Toad. Along the board, there are hidden block spots. Land on one of those and you’ll get an item. The items aren’t that great, so I always wish for a mushroom (which adds 3 to your roll), a gold mushroom (which adds 5 to your roll), or a double dice block. You can grab coins where they appear and coin balloons. When popped, a mini game happens. The overall idea is to make it to the boss space, which holds a star. You collectively battle a boss and whoever gets the most points gets the star. This happens three times, the third and final boss holding two stars. During the game, ally characters appear to help you out. These characters include Mario, Peach, Yoshi, Waluigi, most typical characters you can play in Mario Party. Each ally has its own unique dice block and a certain skill. For example, if you have Yoshi on your team and you stand next to an apple, he’ll eat it and coins will appear. The allys appear randomly on the board and you have to race your opponents to get to them. You’re allowed to have four allys with you and trust me, it helps. They’re CPUs, but they’re on your team. So, during the boss battles, you have five characters adding to your points. Plus, they roll a dice block with you. Your dice block goes up to six and while they have unique blocks, if you’re not playing as them, they’ll roll a block that goes up to two. So, you can roll a six and if you have four partners and they each get a two, you’ll end up moving 14 spaces. Coins are super important, like in all Mario Party games, but I find them more important in this game. At the end of each game, they tally your coins. You get a star for each ten coins you have. So, if you end the game with 56 coins, you get five extra stars. Coins are hard to come by though. The game is pretty cheap when it comes to handing out coins. Sometimes they’re scattered along the board and you just have to get there before your opponents do. Even then, it’s only one coin. Balloons will sometimes appear. That holds a small handful of coins and brings on a mini game. If you get first in a mini game, you get 5 coins. Second place will award you 3 coins, third will get you 2 coins, and fourth place will give you only 1 coin. If you land on the boss space, you’ll be rewarded with five coins. There are five “worlds,” but the first one is called World 0, which is mainly for practice and learning the tools of the game. So, there’s really only four playable Worlds. Each World has three levels of the same board. World 1 has a beach theme, World 2 has a Haunted Boo House theme, World 3 has a cake theme, and World 4 is a Bowser Castle theme. So, yeah… four worlds, four boards. The third level of each board isn’t that hard and the game still doesn’t take long to play. So, in this department, the game kind of failed for me. I was hoping for more variety in boards and for them to be a little harder. Sure, they each had some good qualities to them, but it wasn’t anything major and it really didn’t make the game any more difficult. There are ten bosses total. They’re all pretty straight forward and simple. Bowser is one of the bosses, but he only appears when you’re playing the Bowser Castle board. So, if you’re playing any other board there are only nine bosses. They hold the stars you need to get. The first two bosses each have one star and the final boss has two stars. Get the most points in these battles and you’ll get the star. It’s simple enough, but it’s pretty one-sided. If you have a ton of ally characters, you’re almost guaranteed a win. If you reach the space first and your opponents are far away, they have to rapidly mash the “A” button to reach the space, so you get a head start on the battle. If you get the last hit on the boss, then you get an extra 3 points, which often makes or breaks who wins. I like some battles more than others. For example, battling Mega Goomba and Mega Blooper are kind of random. You’re not directly battling the bosses. You’re stealing apples from Goomba and you’re playing music with Blooper. Whereas when you encounter Mega Boo you have to bring flashlights to him in order to hit him and for Mega Monty Mole, it’s a big whack-a-mole game. Those are fun. Still, the bosses can get repetitive depending on how much you play and, like I said before, they can be one-sided and you know who will win the battle before it even starts. This game only has 53 mini games total. The includes the boss battles, the Bowser games, and the coin games from the Coinathlon mode. I think the amount of mini games you can play for the main mode, Toad Scramble, is 26. It’s not much at all. The games that are available aren’t that great, either. No mini games compare to Mario Party 2 or any of the older Mario Party games, but I felt as though they could have at least added more. I have to say that I had more fun with the other modes than the regular party mode. I didn’t enjoy Toad Scramble as much as I should have. There are six other modes: Coinathlon, Mario Shuffle, Balloon Bash, Rhythm Recital, Challenge Tower, and Boo’s Block Party. Some are pretty out of place for the Mario Party game (like Rhythm Recital, Challenge Tower, and Boo’s Block Party). However, I had more fun with those modes than the others. Toad Scramble was one-sided and little boring at times. It was an interesting concept, but I think they could have done better with it. I unlocked the master difficulty setting for the CPUs, which is the hardest setting for them, and I still dominated them. It was too easy, especially with the ally characters and the final hit on the boss battles. This game is worth playing, if only for the other modes. The graphics in this game are great. They’re 3D, going along with the 3DS and modern times. The characters run smoothly and they each have their own facial expressions, though it’s not very varied. Still, it’s a Mario Party game, so they really only need to happy to win, sad to lose, or neutral. I played multiplayer with Kris to try it out and that ran smoothly as well. I wanted to show her a lot since she doesn’t have the game, but through the download play on the 3DS we were limited to three modes: Toad Scramble, Balloon Bash, and Coinathlon. I only enjoy Coinathlon, but we had fun either way (I think she had fun). Still, it ran nicely through the Wi-Fi so I can’t complain about that. The music was good, as always. I always enjoy Mario Party music. Especially through the Rhythm Recital mode and even Bloopers boss battle. I was always bopping my head to that music. Now that I’ve made it as far as I can go in this game, I’m not sure how much I’ll go back to play. I can’t see myself getting “in the mood” to play this game. If I want to play Mario Party, I’m going to play one of the older games. If I do ever go back to this game, it won’t be to play the main mode. I’ll be playing Boo’s Block Party or trying to beat the Challenge Tower. Great review! I’m somewhat interested in this game. I appreciate all the different modes and boards they’re going for with this entry, but I’d honestly just like a return to the original style of Mario Party – no cars, everyone takes their turn, etc. I’m glad that this was at least a good attempt, but I always wonder if we’ll see a return to the old style. I definitely liked this better than the car. Everyone moves at the same time, but they can do in different directions and it’s like a race. But I agree. I want the old style of Mario Party back.